This is a beautiful 1 year old home with brick front and vinyl siding, concrete driveway and sidewalk. Owners have landscaped around the home. This home features great room open to a large eat-in-kitchen, all appliances remain including the washer and dryer, master bedroom with master bath, 2 other bedrooms and full bath, and laundry area. The kitchen steps out to a 12x14 foot deck with patio beneath for outdoor entertaining. The basement is unfinished but partically studded with a 3rd roughed in bath. The lower level has a 2 car attached garage makes up the other 516 sq ft. of the basement. 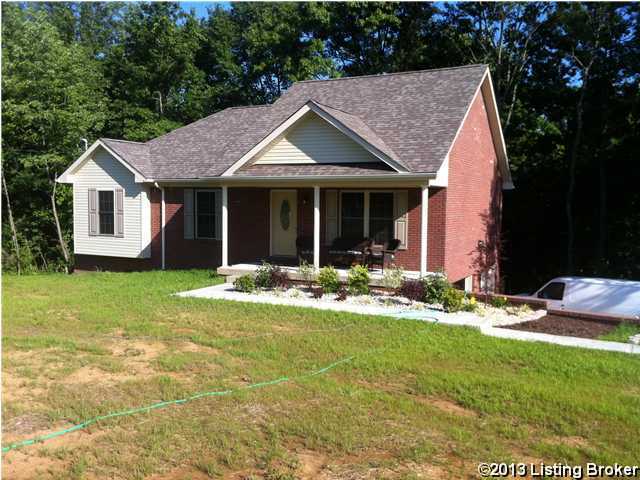 The home sits on 3.84 acres with a beautiful wooded area in back. Come take a look today. Direction: From Taylorsville Hwy 44W just past Waterford Park second road on the right is Hickory Woods Drive property on left. Hickory Woods is a subdivision within the city of Taylorsville, Kentucky. There are currently 1 Homes for Sale within Hickory Woods, with asking prices ranging from $16,500 to $16,500. The average list price per square foot of the available inventory in Hickory Woods is $7,674, which is above the Taylorsville average of $190. The Average Sales price of all sold real estate in this subdivision for the past year is $199,000. Recent comparable homes have been selling for 98.80% of their asking price. Waterfront homes represent 0.00% of the available Hickory Woods inventory. The population of Taylorsville, according to the 2010 Census, is 763. The total number of households in the zip code of Hickory Woods is 5,147, with an average household size for of 2.75 people. The total number of renter households within the zip code of 40071 is 866, which means that 83.17% of households in this zipcode are owner occupant households. 365 Hickory Woods Dr, Taylorsville KY 40071 is a Home, with 3 bedrooms which is recently sold, it has 1,314 sqft, 0 sized lot, and 2 1/2 Car Garage,Attached,Entry Side,Lower Level parking. A comparable Other, has bedrooms and 0 baths, it was built in and is located at and for sale by its owner at $ 0. This home is located in the city of , in zip code , this County Other, it is in the Subdivision, and TOP FLIGHT LANDINGS are nearby neighborhoods.